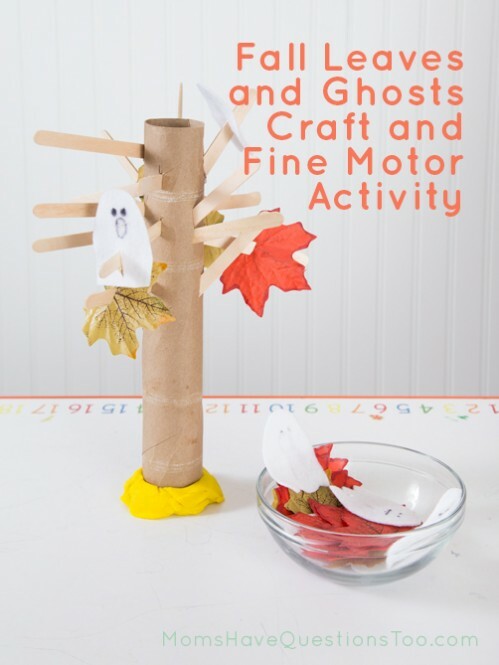 What is a fun fine motor game that will be fun for Halloween and for Thanksgiving? 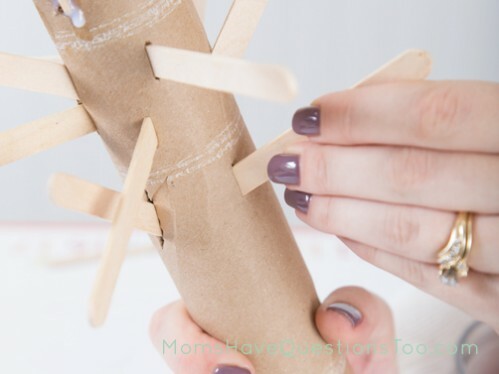 So, I wanted to do a fun activity/craft with my kids. And I wanted something with a Halloween theme because Halloween is just a few days away. 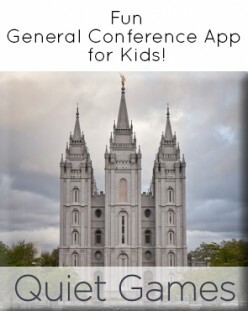 But, I also wanted something I could leave up past Halloween and that my kids could keep playing with after Halloween. 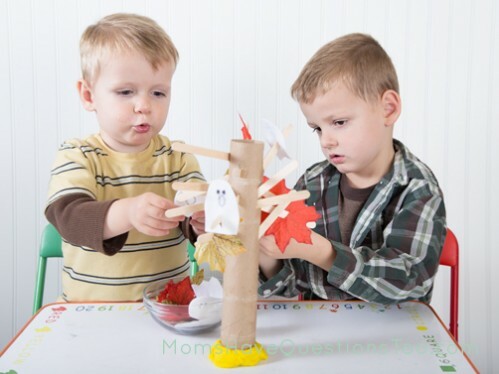 Does it really matter if I keep a Halloween decoration up past Halloween, or that my kids keep playing a Halloween themed fine motor game past Halloween? No, it really doesn’t, but I’m kind of weird about holidays. So, I came up with a game that has a fun Halloween twist, but that can easily be played after Halloween. Score! 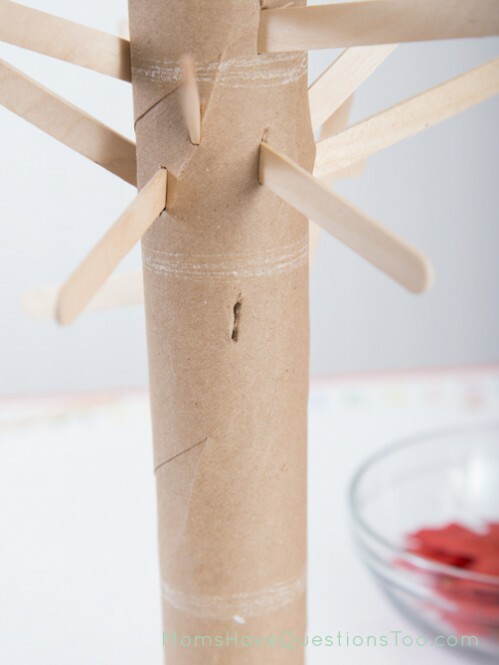 Start by making several slits in the empty paper towel tube that are big enough for a popsicle stick to fit through. Basically you want it to look like tree branches coming out of a tree trunk. 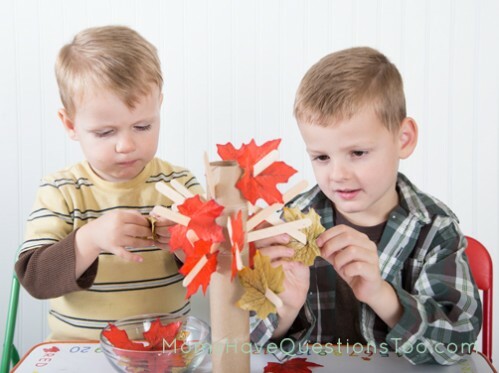 Once you have enough slits for however many branches you want, put the popsicle sticks into the slits so that you have a nice “tree” with empty branches. Next, cut small slits in the leaves. 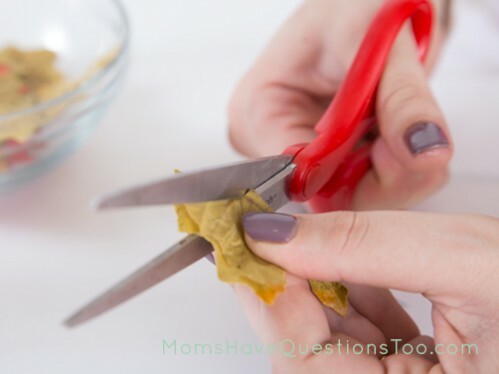 Make sure the slits are big enough that the leaf will fit onto a popsicle stick. 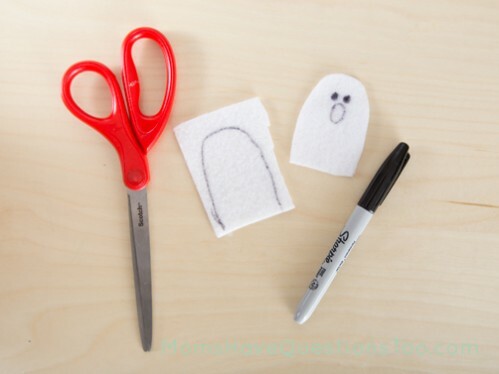 If you want to play this game with a Halloween twist, cut out a bunch of ghost shapes from white felt and draw a face on with permanent marker. 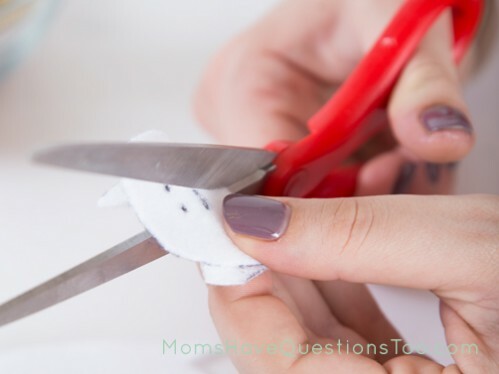 Cut a slit in each ghost so that it can fit on a popsicle stick. Once Halloween is over, I plan to take all of the ghosts off of the tree, and keep only 28 leaves on the tree. 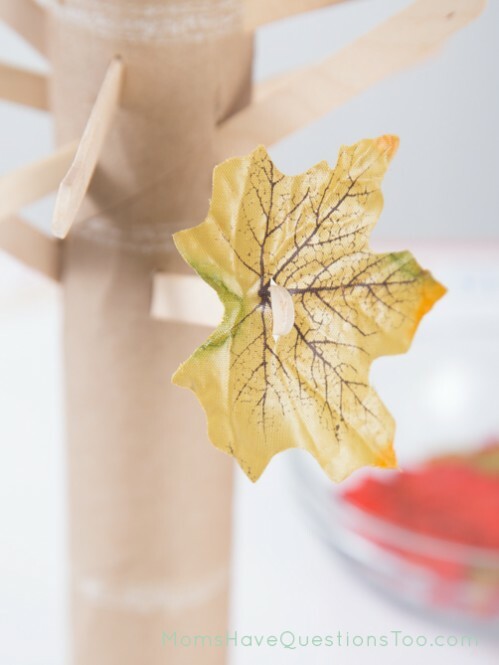 I’ll do a short mini lesson on November 1st about how leaves fall off trees in the fall, then I’ll tell my kids that each day they can take one leaf off of the “tree” and when there are no leaves left, it will be Thanksgiving! How’s that for a double duty activity? 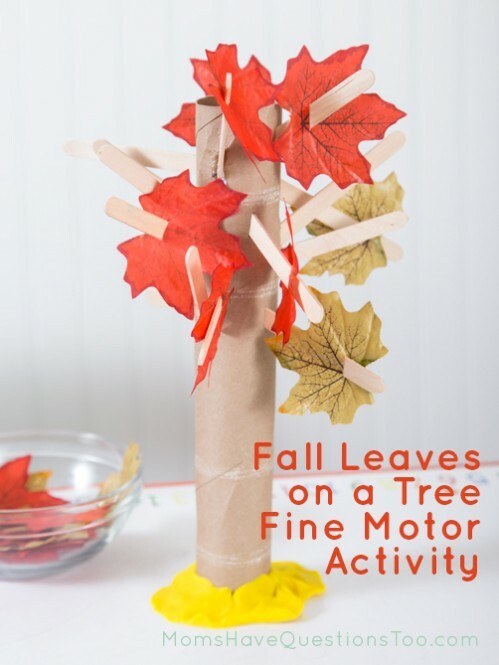 This activity is great because it has a fun Halloween twist, it really gets kids to practice fine motor skills as they put the leaves onto the popsicle sticks, plus it will end up being a countdown to Thanksgiving! 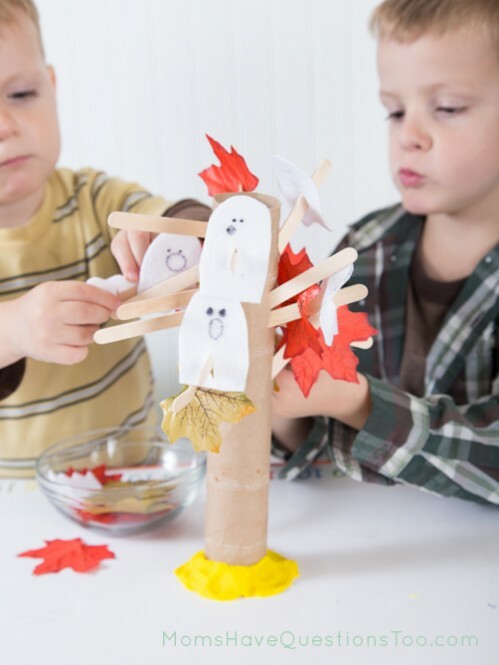 My kids loved the Halloween twist for this activity and I know they will love the Thanksgiving countdown.